West Papua solidarity groups from across Aotearoa New Zealand have launched a formal parliamentary petition calling on the New Zealand Government to speak out about the human rights situation in West Papua. Please help us get as many signatures as possible before 24 August 2016. Please print the signature sheet attached if you are able to collect signatures. All signatures must be recorded on these sheets to be counted. Please send completed sheets to WPAA, PO Box 68419, Auckland (or alternative arrangement). Please sign and share the online petition (easy to share from our FB page). Let’s urge New Zealand to stop turning a blind eye to the atrocities playing out in West Papua. Urge the Pacific Island Forum to support this stand and advocate for West Papua at the United Nations. West Papua Action Auckland (WPAA) is shocked at Murray McCully’s refusal to back a fact-finding mission for West Papua at the Pacific Island Forum. ‘It is well past time that New Zealand woke up to the most serious human rights crisis in the Pacific. The blind eye approach is disgraceful in the face of ongoing security force killings and torture not to mention the repression of basic freedoms such as the right to raise a flag or get signatures on a petition,’ said Maire Leadbeater for West Papua Action Auckland. ‘The Melanesian Spearhead Group (MSG) opted to grant observer status to the new umbrella group the United Liberation Movement for West Papua. The MSG leaders accepted a 55,000 signature petition calling for West Papuan inclusion in the MSG – the signatures were gathered from people from all across the territory despite severe security force intimidation. This amazing democratic effort must not be in vain. As the Pacific Island Forum summit is imminent and the issue of West Papua will be under discussion by the Forum Heads of State, we would like to draw your attention to some significant and disturbing developments. We believe these developments establish that it is now urgent for New Zealand and other Pacific leaders to undertake a fact-finding mission to West Papua. The past few months have seen a major escalation in the numbers of people arrested for taking part in peaceful activities, many of which were in support of the international initiatives of the ULMWP. A number of the activities at which people have been detained cannot fairly be described as protests but rather as prayer sessions or celebrations. For example on 3 July 2015 40 people were arrested for taking part in a prayer session to give thanks for the decision of the Melanesian Spearhead Group (MSG) to grant observer status to the ULMWP. The month of May was a terrible month for arbitrary arrests, with an estimated 487 people being detained – mostly for short periods. Some of these arrests took place on 1 May, the date that marks the anniversary of the day in 1963 when Indonesia assumed administrative control over West Papua. Others were arrested while taking part in activities to support the bid by the ULMWP for membership of the MSG. There were many reports of beatings and torture. We understand that pre-emptive arrests deliberately targeted people who planned to take part in peaceful demonstrations, particularly those from the West Papua National Committee (Komite Nasional Papua Barat, KNPB). Since May this year, a further 264 people have been arrested for expressing their support or for being involved with the ULMWP. The Indonesian authorities have adopted a harsh ‘zero tolerance’ policy towards the peaceful expression of support for the ULMWP. No one can doubt the level of popular support for the ULMWP in West Papua – not only are so many willing to risk their personal liberty and safety to join public activities, but also over 100,000 signatures supporting the MSG campaign were obtained in the lead up to the leaders’ Summit. 55,000 were received in time to be formally presented. Since no international journalists were present there was little news of this signature campaign, but it was undertaken with great thoroughness and signatures were authenticated with addresses and copies of state-issued identify cards. There were letters of support from Churches, Customary Chiefs, women and student groups and prominent individuals. Many Indonesian migrants also signed. Getting to West Papua’s remote communities represented a challenge to the signature gatherers as did getting the forms out of the country. It is outrageous that this peaceful and democratic exercise was met with so much obstruction by the Indonesian Security Forces, and their harsh reactions should be roundly condemned. As you are aware the victims of security force harassment and violence in West Papua are predominantly those who have publicly expressed their support for self-determination or independence. Often the harassment extends to the human rights lawyers and human rights defenders who attempt to protect the rights of such activists. In recent weeks we have received a number of reports of incidents of the harassment of human rights defenders. A recent example concerns the case of Roby Erik Pekei, the victim of a police shooting who was injured in his right ankle and left leg. Those attempting to protect him were subject to police harassment during his attendance at the Wamena Hospital and later in the courtroom at his pre-trial hearing on 28 July 2015. Ms Anum Siregar, is one of Mr Pekei’ s lawyers and last year was stabbed in the hand when she defended a high-profile treason case. Other human rights lawyers including Gustaf Kawer and Ms Olga Hamadi have also faced extreme threats of violence in the past few years. The news of decision of the MSG leaders to grant observer status to the ULMWP was greeted with joy in West Papua. This move has raised high hopes that the other members of the ‘Pacific Family’ represented at the Pacific Island Forum meeting will also listen to West Papuan pleas. For New Zealand, a nation committed to democratic ideals and human rights, there is now an urgent moral imperative for us to do what we can to end this ongoing violence and repression. One immediate step we can take is to support the formation of a Pacific Fact Finding Mission to go to West Papua to meet with all sectors of society and to learn at firsthand about the situation in this largely closed off territory. We look forward to learning of the New Zealand Government’s support for this vital initiative. We are writing to you at a crucial moment for the people of West Papua and their hopes to be accepted back into the Melanesian family of nations. At a historic meeting of West Papuan leaders in Port Vila in December 2014 a new organisation called the United Liberation Movement for West Papua (ULMWP) was formed. This new umbrella organisation has submitted an application for membership to the Melanesian Spearhead Group (MSG). The ULMWP is now the only unified and recognised coordinating body with a mandate to seek West Papuan membership to the MSG. It has the support throughout Tanah Papua. We are puzzled at the recent suggestion from Papua New Guinea’s Prime Minister Peter O’Neill that Indonesia could be admitted to Associate Membership of the MSG. Indonesia’s claim to Melanesian status appears to be a self-serving tactic designed to undermine the West Papuan bid for MSG inclusion. It is only in the last two or three years that Indonesia has begun to acknowledge its Melanesian citizens. It is no coincidence that this development has come at the same time as support for self-determination for West Papua has escalated among the Melanesian populations of Fiji, Solomon Islands, Papua New Guinea, Vanuatu, and New Caledonia. As people throughout the Pacific region and all around the world become more aware of the situation solidarity with the people of West Papua and support for its application to join the MSG is growing. We cannot forget the life and legacy of Arnold Ap, the former curator of the Jayapura Anthropology Museum, who played such a vital role in reviving and promoting traditional Papuan music and culture. The Indonesian authorities considered his dedication to his Melanesian culture as ‘subversive’. He was arrested, detained without charge for several months, and assassinated by Indonesian troops in April 1984. During his recent visit to West Papua Indonesian President Joko Widodo announced the release of five political prisoners and stated that international journalists would now be free to visit West Papua without needing to be screened by a special Clearing House Committee. While we welcome these steps they must be placed in a fuller context and should not be allowed to obscure the fact that the Papuan people are still being denied their right to self-determination. The five prisoners were released under ‘clemency provisions’ which require them to admit guilt for their past actions. As you know, many political prisoners including Filep Karma, a high profile Amnesty International Prisoner of Conscience, are held for no other reason than for raising the banned Morning Star flag or participating in a peaceful demonstration. These prisoners must be released unconditionally as they are not guilty of having committed any crime. If the release of the five prisoners is to be seen as genuine progress, it must be followed by an increase in the rights and democratic freedoms of the Papuan people. Unfortunately there are signs that the opposite is happening. On 1st May 2015 over 260 West Papuans were arrested by security forces for simply taking part in peaceful rallies in contravention of their right to freedom of expression and assembly. They were commemorating the 52nd anniversary of the administrative transfer of West Papua to Indonesia. Throughout all of last year there were harsh crackdowns on numerous peaceful rallies, especially those of the West Papua National Committee (KNPB). All sectors of society in West Papua including lawyers, human rights defenders, activists, clergy and journalists faced regular intimidation or the threat of arrest. The year ended with a shocking massacre of four school boys when on 8th December 2014 security forces fired into a crowd of approximately 800 peaceful demonstrators (including women and children) in Enarotali in the Panai regency. Despite international media coverage the perpetrators of this outrage have not been brought to justice. While we hope that foreign journalists will now be able to visit and report on West Papua free from stringent visa procedures or the risk of deportation it is disconcerting that the President’s assurance has already been cast into doubt by contradictory statements made by members of his administration. Coordinating Minister for Political, Legal and Security Affairs Tedjo Edhy Purdijatno was quoted as saying that foreign journalists will still be screened before being issued permits for Papua. The national police spokesman Sr Comr Agus Rianto made a similar statement. We acknowledge the strong support already declared by Vanuatu and FLNKS for West Papua’s full membership to the MSG and hope that this support will encourage other MSG leader’s to do the same. 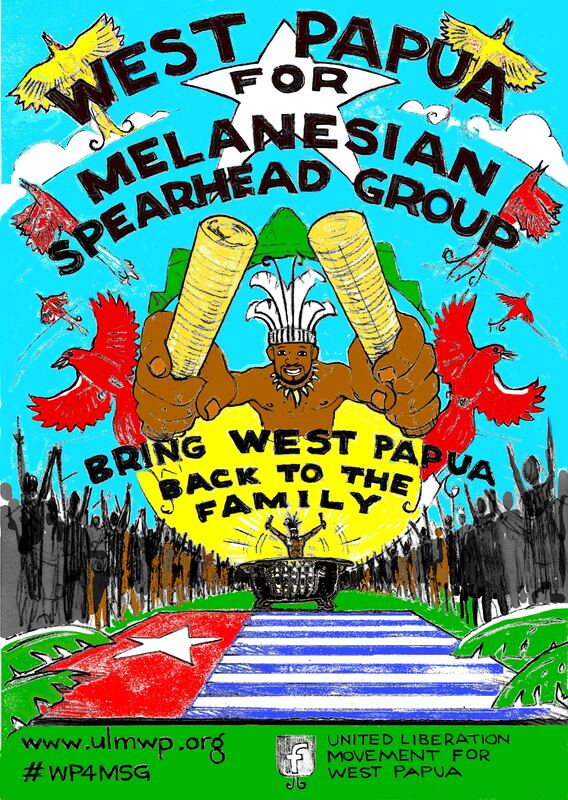 In the light of the ongoing unsettled situation and the clearly expressed will of the Papuan people we encourage you to support their application to join the Melanesian Spearhead Group by granting membership to the United Liberation Movement for West Papua. We believe this step has enormous support among the people of the Melanesian countries as well as among those in the wider Pacific region. West Papua needs support in order to progress towards a peaceful resolution of a tragic longstanding conflict. What is the Melanesian Spearhead Group (MSG)? Who are the MSG members? Why is West Papua membership of the MSG important for human rights and development of West Papua? What is West Papua’s historical engagement with Pacific Regional Groupings? How is the MSG linked to the Pacific Islands Forum? Has West Papua tried to join the MSG before? What is the United Liberation Movement for West Papua (ULMWP)? When will the MSG consider the ULMWP application to join the MSG? What influence does Indonesia have on the MSG through Observer Status? What role do Melanesian leaders and civil society have? Why should non-MSG countries, such as Australia and New Zealand care? And what should we do? 1. What is the Melanesian Spearhead Group (MSG)? The MSG is a regional block of Melanesian countries. The MSG was first discussed during an informal meeting in Goroka, PNG, in 1986 among leaders of Papua New Guinea, Solomon Islands, Vanuatu and a representative of the Kanak Socialist National Liberation Front (FLNKS). Two years later, in 1988, the Melanesian Spearhead Group (MSG) was officially formed when the ‘Agreed Principles of Cooperation among the Independent States of Melanesia’ was signed in Port Vila on behalf of the Governments of the Solomon Islands, Vanuatu and Papua New Guinea. The MSG was formed to promote trade and economic co-operation but also to uphold ‘Melanesian cultures, traditions and values’ (Article 2). The importance of common positions and solidarity in spearheading regional issues of common interest was recognised by leaders, this included FLNKS cause for political independence in New Caledonia. The MSG has developed its own Trade Agreement, established in 1993 and revised in 2005, and was formalised under international law in 2007. The new MSG Secretariat building in Vanuatu opened a year later. An MSG leaders’ summit takes place annually. 2. Who are the MSG members? Solomon Islands – founding member. FLNKS – joined in 1989 (part of the key preliminary meeting held in Goroka in 1986). Fiji – joined in 1996. Indonesia has had Observer Status since 2011 following submission of a membership application in 2010. Vanuatu strongly opposed membership, however Fiji (through leadership of Prime Minister Frank Bainimarama, then Chairman of the MSG’s Leader Summit) and PNG (through Sir Michael Somare, then Prime Minister of PNG) were in support of the application. Indonesia’s Observer Status gives the country significant leverage within the MSG. Neither West Papua nor any representative of West Papua is a member of the MSG. West Papuan representatives were participants, alongside fellow indigenous Pacific leaders, of the first regional South Pacific Commission conference held in 1950 (see Question 4) and have lobbied for membership in MSG through various avenues since the MSG’s inception. 3. Why is West Papua membership of the MSG important for human rights and development of West Papua? West Papua is historically, culturally and geographically part of Melanesia and the wider Pacific region. West Papua forms the western half of New Guinea, while Papua New Guinea forms the eastern half. Indonesia has been in effective control of West Papua since 1963. In 1969, Indonesia held an ‘Act of Free Choice’ where the government selected 1022 Papuans from a population of nearly one million and forced them to declare that West Papua wanted to remain part of Indonesia. This act of ‘no choice’ violated the fundamental right to self-determination for all people as guaranteed by the UN. To this day, the Indonesian military, paramilitary police (Brimob) and intelligence agencies continue to terrorise the West Papuan people. Journalists and humanitarian workers are either denied entry into West Papua or their movement tightly controlled. Indonesia is using an appeal to sovereignty as a justification for the continuing violence, which has resulted in the deaths of an estimated 500,000 people over the past 53 years. West Papua’s membership of the MSG means its people would have an international voice without the influence and fear of Indonesian military rule and oppression. Membership in the MSG would enable West Papua to gain a regional platform from which serious human rights, sovereignty and development concerns could be raised. Specifically, membership of the MSG would assist West Papuans to pursue their just rights to self-determination in the UN Decolonisation Committee and other international forums. West Papuans seek to re-join their Melanesian family and participate in the benefits of trade, security, worship and partnership. There is a clear precedent for a liberation movement to be included alongside formally independent nations as the FLNKS is a full member of the MSG. West Papuan leaders have stated that they are prepared to play their role in upholding the security and well-being of all Melanesian nations. West Papua and Kanaky would be able to offer each other mutual support along the road to decolonisation. The MSG currently supports the FLNKS as New Caledonia progresses along the self-determination agenda set out in the Noumea Accord. 4. What is West Papua’s historical engagement with Pacific Regional Groupings? In 1947, the colonial powers with Pacific territories – US, UK, Netherlands, New Zealand, Australia and France – signed an agreement in Canberra to form the SPC to address development not political issues. The first regional SPC conference was held in 1950, where West Papuan leaders were able to take part alongside fellow indigenous Pacific leaders. The South Pacific Forum first met in New Zealand in 1971, bringing together independent Pacific states. Its membership grew as new nations achieved independence and in 1999 it was renamed the Pacific Island Forum (PIF). The PIF holds an annual summit and a Post Forum dialogue with participants from a wide range of international partners. In 2000, West Papuan leaders were permitted to attend the 31st Pacific Islands Forum Summit (PIFS) as members of the Nauru delegation. At this meeting, the Forum Governments agreed to a historic statement expressing their deep concern about the human rights situation and the on-going violence in West Papua. Subsequent PIF communiqués also included expressions of concern about human rights, while continuing to acknowledge Indonesian sovereignty over West Papua. In 2007, the communiqué included only a reference to the PNG Prime Minister’s intention ‘to convey the Forum discussions on Papua to the President of Indonesia.’ Since then PIF communiqués have not included a mention of West Papua. 5. How is the MSG linked to the Pacific Islands Forum? The MSG and PIF memberships overlap and the groupings are seen as complementary rather than competitive. The MSG is arguably the most important Pacific sub-regional grouping, as it is composed of Pacific Island nations with the biggest populations and resources for trading and security relationships in Oceania, which includes important regional relationships with Australia and NZ and other smaller Pacific Island countries. 6. Has West Papua tried to join the MSG before? Vanuatu appealed unsuccessfully to the MSG in 2008 to include West Papuan representatives as observers. In 2013, the West Papua National Coalition for Liberation (WPNCL) made a formal bid to the MSG for membership, but this was deferred pending an Indonesian-hosted MSG ‘Fact Finding Mission’ to West Papua. The Government of Vanuatu boycotted the mission because the schedule allowed for only a brief sojourn in West Papua and made no provision for the delegates to meet with any indigenous representatives with a dissenting voice. On 24 June 2014, MSG leaders held a special meeting in Port Moresby, PNG, and suggested West Papuan representatives unite and form an umbrella group, and reapply for membership of the MSG. The government of Vanuatu followed up that decision by funding and hosting a meeting of West Papuan leaders in Port Vila from 30 November to 6 December 2014. The Pacific Conference of Churches (PCC) facilitated this reconciliation meeting during which the United Liberation Movement for West Papua (ULMWP) was formed. On 4 February 2015, the newly-formed ULMWP made a renewed bid and lodged an application for full MSG membership at the Secretariat of MSG in Port Vila, Vanuatu. 7. What is the United Liberation Movement for West Papua (ULMWP)? The United Liberation Movement for West Papua (ULMWP) is a unified body of various factions of the West Papuan independence movement. The key groups to have united include the Federal Republic of West Papua (NRFPB), National Coalition for Liberation (WPNCL), and National Parliament of West Papua (NPWP), which incorporates the KNPB (National Committee for West Papua). The ULMWP was established in December 2014 during a ‘Unification Meeting’ hosted by Vanuatu and facilitated by PCC. The meeting has been recognised as the most important gathering of West Papuan leaders since the struggle began approximately 53 years ago. Any concerns that the West Papuan groups are ‘not united’ can now be dismissed. ULMWP is now the only unified and recognised coordinating body with a mandate to seek West Papuan membership to the MSG. ULMWP is coordinated by an external secretariat comprised of five elected members: Octovianus Mote (General Secretary), Benny Wenda (spokesperson), and Rex Rumakiek, Leone Tangahma, and Jacob Rumbiak (members). In West Papua, three founding organisations have set up an internal secretariat and are working together as a bridge between ULMWP and the entire West Papuan people. 8. When will the MSG consider the ULMWP application to join the MSG? The MSG is scheduled to meet in July 2015 in the Solomon Islands. It is likely that the MSG will consider the ULMWP’s application during this meeting. 9. What influence does Indonesia have on the MSG through Observer Status? In 2011, Indonesia was granted Observer Status at the MSG. Indonesia has successfully used this avenue to deflect the West Papuan bid for MSG membership by the offer to host a Fact Finding mission and through other less direct means. Indonesia now claims it has ‘the world’s largest Melanesian population’, even going as far as to say there are ‘11 million Melanesians in Indonesia’ – a contentious claim based on including the peoples of Maluku and the lesser Sunda Islands as ‘Melanesian’. Indonesia has had success in exerting influence over the MSG nations by a mixture of diplomacy, trade offers, financial aid and military training support. Vanuatu is an exception because of its long background of political support for West Papua backed by strong grassroots sympathy. Vanuatu also proposes other diplomatic initiatives such as approaching the International Court of Justice. 10. What role do Melanesian leaders and civil society have? The support of the Melanesian countries Papua New Guinea, Vanuatu, Solomon Islands, Fiji and FLNKS is needed to bring full membership to the MSG for West Papua. It is now up to Melanesia’s civil society to insist that their Governments prioritise the West Papuan cause over the lure of Indonesia’s ‘cheque book diplomacy’. This is increasingly important as Indonesia works to strengthen relations with Melanesian countries through, for example, joint military training. 11. Why should non-MSG countries, such as Australia and New Zealand care? And what should we do? In the 1960s, Australia and New Zealand reversed their earlier support for the Dutch plans to promote self-determination for West Papua. They betrayed the West Papuan people, ignoring the travesty of the 1969 Act of Free Choice and downplaying the massacres and grave human rights abuses that have taken place over the subsequent years. As Australian and New Zealand citizens, we have a clear moral responsibility to take action on behalf of justice and peace for the Papuan people. History of West Papua (One example of a web summary): http://freewestpapua.org/info/history-of-west-papua/. The United Nations and decolonization: http://www.un.org/en/decolonization/. ‘West Papua resubmits application for MSG membership’. 5 Feb 2015. Office of Benny Wenda. http://bennywenda.org/2015/west-papua-resubmits-application-for-msg-membership/. ‘West Papuans unite under a new umbrella group’. 9 Dec 2014. Office of Benny Wenda. http://bennywenda.org/page/2/?s=ULMWP. ‘West Papuan Leaders join International Solidarity Groups’ (Brisbane). 1 April 2015. Pacific Scoop. http://pacific.scoop.co.nz/2015/04/west-papuan-leaders-join-international-solidarity-groups/. ‘West Papuans unite to form new umbrella group’. 10 December 2014. Pacific Institute of Public Policy. http://pacificpolicy.org/2014/12/west-papuans-unite-to-form-new-umbrella-group/. Camellia Webb-Gannon and Jim Elmslie, ‘MSG Headache, West Papuan Headache? Indonesia’s Melanesian Foray’, The Asia-Pacific Journal, Vol. 12, Issue 47, No. 3, November 24, 2014. japanfocus.org/-Camellia-Webb_Gannon/4225. Jim Elmslie, ‘West Papuan Demographic Transition and the 2010 Indonesian Census: “Slow Motion Genocide” or not?’, CPACS Working Paper 11/1. September 2010. http://sydney.edu.au/arts/peace_conflict/docs/working_papers/West_Papuan_Demographics_in_2010_Census.pdf.